Should the Parthenon Marbles be returned to Greece? I’m all for it, it is not just “classy” as Stephen Fry said recently in a TV debate but actually it was since the very beginning an act of imperialist looting that would be frowned upon also today (and was already back in the day considered quite questionable). By all accounts, the marbles were looted by the British ambassador in Constantinople Thomas Bruce (alias “Lord Elgin”) without any sort of authorization by even the imperial authorities of the Ottoman Empire, then occupying power of Greece. The marbles, which date from Classical Greece, exposed since the early 19th century in the British Museum, suffered from the brutal pollution of London in much of all this time and have been damaged by primitive restorers. 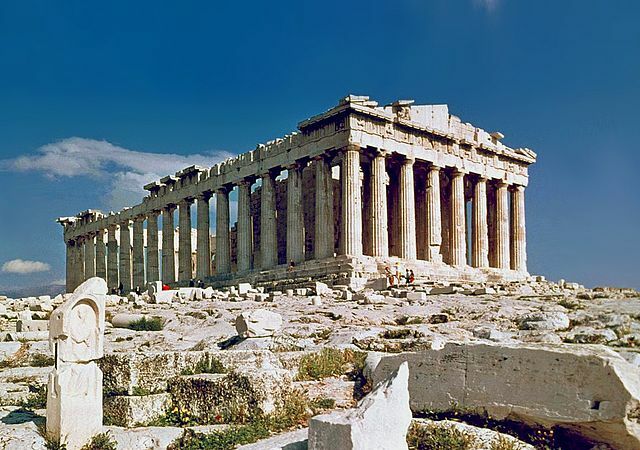 Meanwhile the Parthenon in Greece stands as a naked ruin, largely deprived from its original fullness. The Late Bronze Age crisis in Britain, why? There is a lengthy article today at BBC on what appears to be an economic crisis in Late Bronze Britain, between roughly 800 BCE and 500 BCE, when Iron begins showing up and a recovery seems to take place. The article is lengthy but inconclusive. However I have my own ideas of why this decline: the Celtic invasion of Western Iberia, which, together with other parts of Atlantic Europe constituted an economic region since the beginnings of Megalithism beyond Portugal, in the fourth millenium BCE. Hence, when we contemplate this crisis in Britain we are surely contemplating the last, extremely decadent, episode of an international civilization that had some three millennia of unwritten history. c. 4800 BCE the first dolmens (chamber tombs) appear in Southern Portugal, with their characteristic “collective” (clannic, sequential) burial style. This type of tomb defines the cultural phenomenon we can well call Domenic Megalithism. c. 3800 BCE Dolmenic Megalithism migrates to Armorica (Brittany, Mid-West France), where it acquires an elitist flavor peculiar of this country. c. 3500-3000 BCE Dolmenic Megalithism expands through all Atlantic Europe, often hybridizing with other pre-existent of co-arriving traditions and in some cases at least signifying the first or almost first serious Neolithic, with the demographic implications this may have. Further expansion happens then into parts of Central Europe (Danubian area north of the Alps) and, later, into parts of Italy and North Africa. c. 2400 BCE Central and Northern European parts of this area (east of the North Sea-Rhine line) are lost to Indoeuropean culture (Corded Ware), however Western France and Belgium are consolidated into it (Artenac culture). For a whole millennium this ethno-cultural divide at the Rhine is stable. Bell Beaker (a secondary mercantile phenomenon) acts as a unifying force probably at between Westerners and Indoeuropeans. Around 2000 BCE the center of Corded Ware is at Zambujal, which is a thriving civilization. c. 1800 BCE Los Millares is replaced by El Argar, a larger state probably, and one influenced by Mycenean Greece, specially in its last phase. c. 1250 BCE Indoeuropean tribes (proto-Celts more or less) descend along the right bank of the Rhône river penetrating into Catalonia. It is the Urnfield culture expansion that has reflections in other parts of Europe (but does not affect other parts of the West yet). c. 1200 BCE Zambujal civilization ceases to exist, coincident with a silting of its 10 Km long “marine branch” or canal, which joined it to the Atlantic Ocean (tsunami?) At a similar date El Agar state collapses and its cities become independent (it seems: post-Argarian culture). Atlantic Europe, not really anymore Megalithic in any intense sense of the word, retains its distinct personality within the Atlantic Bronze trade networks. c. 700 BCE Hallstatt-Urnfield Celts of NE Iberia invade the Northern Plateau and the Atlantic areas. It is likely, judging from the archaeological record, that at this time (or maybe a little earlier) the city of Tartessos was destroyed by the Phoenicians of Gadir (modern Cádiz). The Atlantic Bronze economic (and cultural) area is broken for good. This last is what I think that caused the apparent economic crisis in Britain and not just the generic concept of technological advance of Iron: the destruction of their main economic partners in the South, with links to the Mediterranean (Sicily, Cyprus) and such. Only later, as new networks were established with continental (Celts of Belgica and Armorica) and naval (Phoenicians) partners, would Britain experience some economic recovery. But that would also be the seeds of their own Celtization a few centuries later (La Téne). A decision to implement the obsolete Burial Act of 1857 to the context of archaeological research, taken in 2008 by the previous government, is causing upheaval among British archaeologists. The law establishes that all digs of burial grounds be screened from the view of the public and worse: that all remains must be reburied within two years. Scientists are not happy with either measure. Screening from the public view hinders the openness and public access that most of them want for their work (and may get the public suspicious) but the obligation to rebury in a cemetery archaeological remnants that could well be producing results many years, or even decades after their discovery is plainly idiotic. Full story at The Guardian. Originally found at Archaeology in Europe. In a parallel development, another archaeologist, Michael Gibbons, is researching now fish-catching stone structures in Ireland, which apparently also date to the Epipaleolithic but, oddly enough, are still made and used by some modern coastal fishermen. They use these artificial coastal ponds to catch a fish called marine or mearachán, which seems to be a type of smelt. The traps are known as cochill and their design has been transmitted through generations till present day. (Source: Irish Times).